Android appication is responsible for collecting the geoinformation, gather the geospatial information through the functionality provided by their own GPS inside their devices. So, the phone user captures data in the same way as they take a photo, thereby getting their exact, current position. The genetic algorithm to solve UFLP problem with available data can be executed in a phone, solving a complex problem in a mobile device. Collect and store the information of Java and Android clients. Administrator manages the collected information to ensuere its quality. 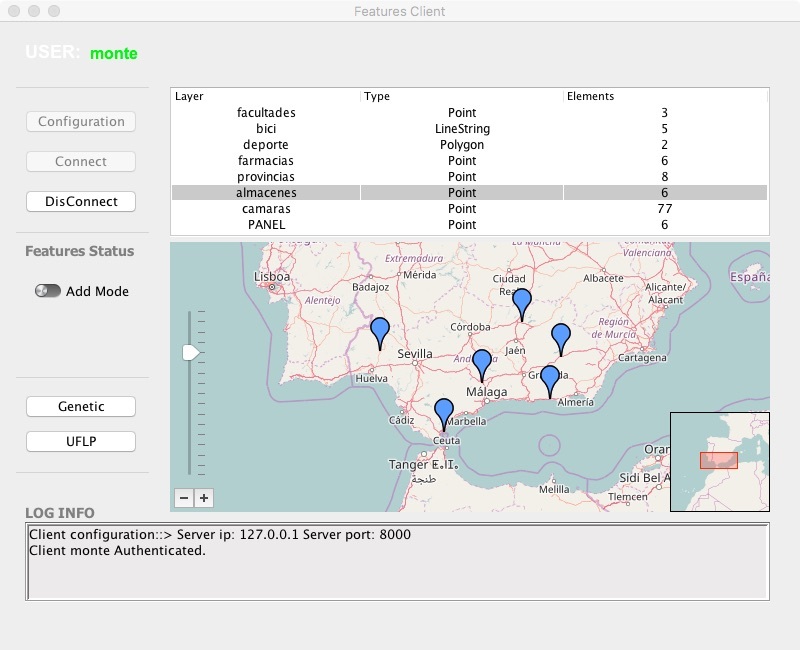 Java client, exploiting the fact that the interaction can be carried out on a larger screen, the data are incorporated into the system directly by the user with the map, by mouse clicking on the different, desired geographic points. UFLP problem can be resolved in a considerable time period with the genetic algorithm designed. In our work we focus on the design of a framework to allow collaborative management of geographic information. The proposed solution enables open data from different organisations to be brought together in the system and amended by the users, checking the quality and reliability of the data provided. Managing the information therefore does not depend on any This means that the information published by an organization is not rendered obsolete and reduces the costs of the upkeep of said information. This system enables information to be generated easily through the evaluation of the data available in it. Given the general nature of the framework, any problem that implies using geographic information organised in layer can be evaluated in it. 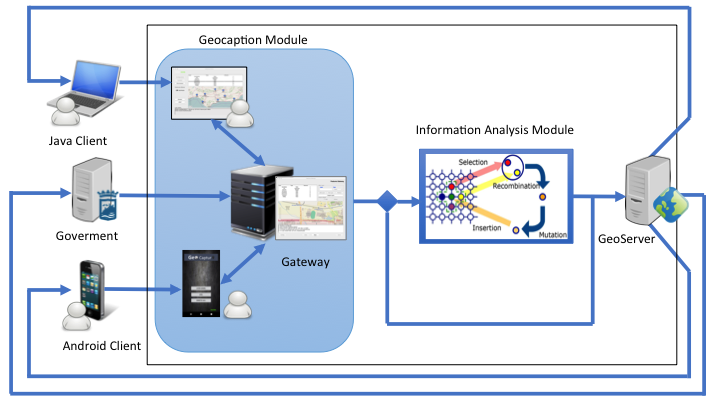 From among the existing problems that use geographic information, we have chosen the Uncapacitated Facility Location Problem as the case study, which allows us to apply a problem to two information layers, regardless of its origins. A genetic algorithm has been implemented to solve the chosen problem, and has performed extremely well on traditional and smartphone platforms. Figure 1. System and framework description. 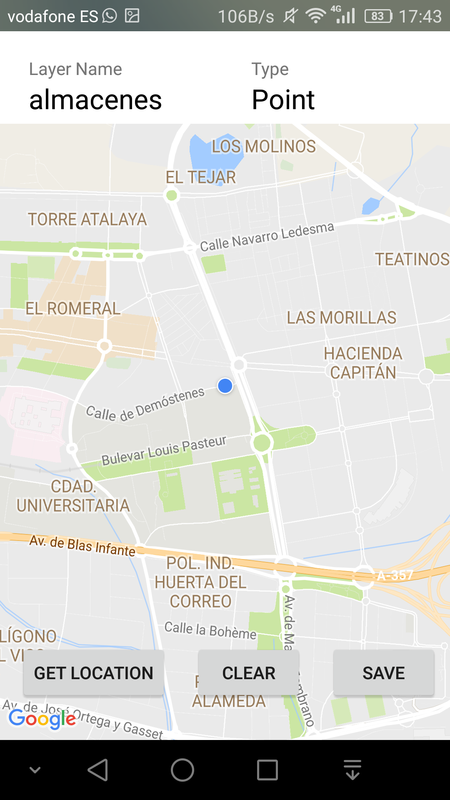 The Java and Android clients are responsible for collecting the geoinformation. The functionality of each of them has been designed according to the characteristics of the terminals used in each case. 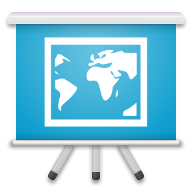 Thus, in a Java client, exploiting the fact that the interaction can be carried out on a larger screen, the data are incorporated into the system directly by the user with the map, by mouse clicking on the different, desired geographic points. 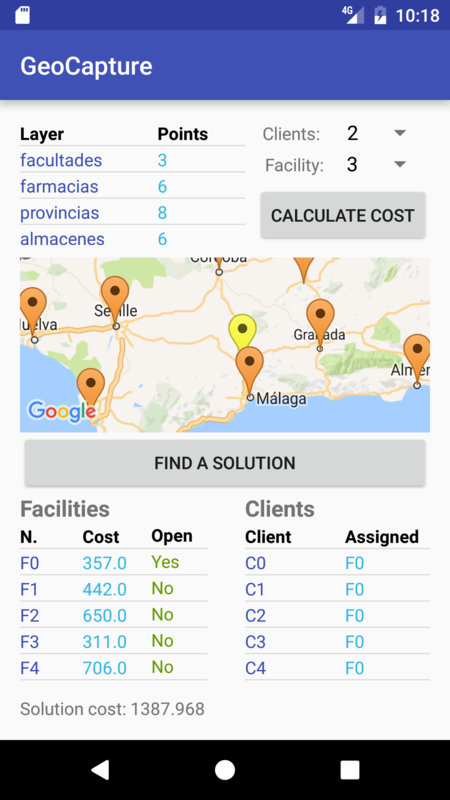 For their part users of mobile clients gather the geospatial information through the functionality provided by their own GPS inside their devices. So, the phone user captures data in the same way as they take a photo, thereby getting their exact, current position. In both cases it is possible to represent single, linear or superficial (both polygons and volumes) objects. 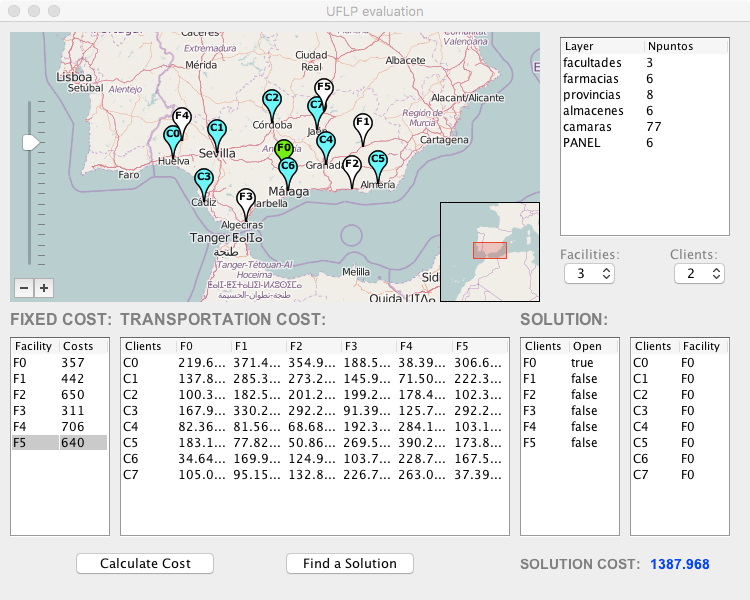 The Uncapacitated Facility Location Problem (UFLP) involves locating an undetermined number of facilities to minimise the total of the fixed setup costs and the variable costs of serving the market demand from these facilities. UFLP has been a well-used optimised problem for the last few decades. It is considered to be NP-hard, although there are special cases which are solvable in polynomial time. Figure 4. UFLP Android client. Figure 5. UFLP Java client.